Private dining in the Grand Kitchen. 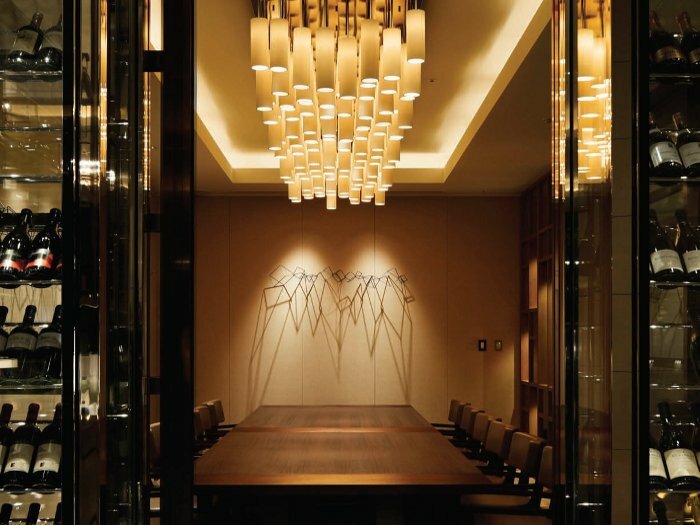 With more than 15 years' experience working in Japan and a portfolio that includes some of the world's most luxurious hotel interiors, GA Design International was a natural choice as interior designer of Tokyo's new Palace Hotel, a three-year project that the practice's managing director, Terry McGinnity, calls a 'labour of love'. Occupying a prime location in central Tokyo, opposite the Otemon Gate of city's Imperial Palace and looking out on to the royal gardens at Marunouchi, the 290-room hotel stands on the site of the original Palace Hotel, which was knocked down to make way for a new 23-storey building. The intention, according to McGinnity, was to 'relaunch and revive' the famous Palace Hotel. 'Since its last refurbishment there have been many technological developments and, also partly due to refurbishment costs, it was decided to rebuild,' he says. Working alongside project architect Mitsubishi Jisho Sekkai and local design practice MEC Design, GA Design International was responsible for the interiors of all public areas including a tea lounge, two of the hotel's three restaurants (the other was designed by 6F), a champagne bar, extensive function and meeting facilities and an Evian Spa, as well as 290 guest rooms and suites. The brief was to 'produce a memorable hotel that honestly reflects its surroundings and heritage', and McGinnity says that every detail of the interior design, from the choice of materials and colours to the furniture and lighting, reflects the culture and history of the hotel's location. Grey marble runs throughout the public areas, creating, says McGinnity, an image of 'strength and harmony'. Bespoke hand-tufted carpets in deep green were inspired by traditional kimono fabrics, while door frames and wall panels in macassar ebony create 'portals' connecting the public spaces - a reference to the nearby Otemon gate. A colour scheme of 'garden greens and cherry-blossom reds' evokes Japan at its most picturesque. 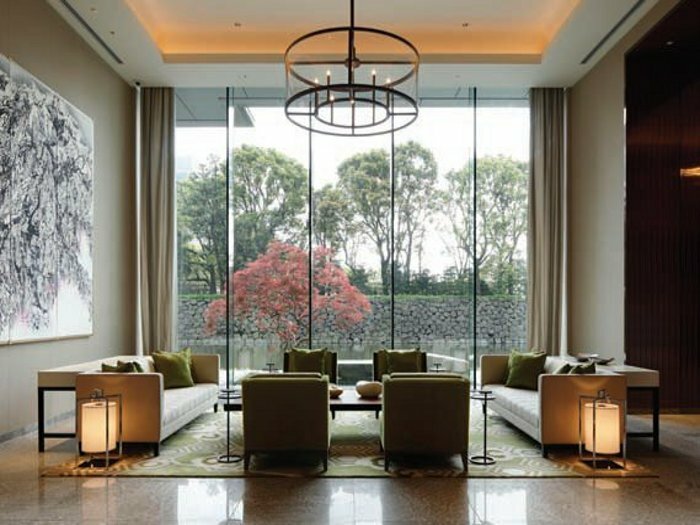 In the reception area, picture windows look out on to a landscaped garden and the Wadakura-bori, the moat that encircles the Imperial Palace. 'The floor-to-ceiling glazing makes you feel as if you could step outside into the landscape,' says McGinnity. The reception gives on to a tall gallery lined with traditional Japanese ink works which in turn leads to the main lobby and an 8m-wide gallery that runs the length of the ground floor. Through a dramatic picture window viewers look out on to a single maple tree. 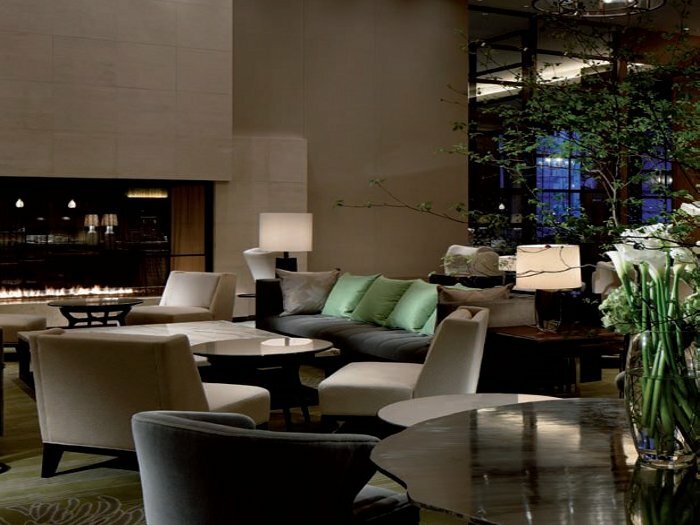 McGinnity says that the hotel is designed to represent a traditional Japanese 'grand residence' with the ground floor imagined as complete with its own tea lounge. The lounge has 6m-high bookshelves that give it a homely feel while macassar ebony and mirror lining give the space a regal ambience. Located behind the tea lounge in a secluded corner is the bar, which McGinnity calls 'a hidden gem'. Its design pays homage to the original Palace Hotel's first bartender, the late Kiyoshi Imai, who was known by the nickname 'Mr Martini'. The original timber bar top on which Imai mixed his drinks has been saved, relacquered and used in the new bar. Glass chillers found behind the bar were also reclaimed from the Grand Palace Hotel. The bar front has panels upholstered in plum-coloured leather and matching stools, all highlighted with low-level lighting. Full-height whisky cabinets, subtly illuminated from within, line the room. 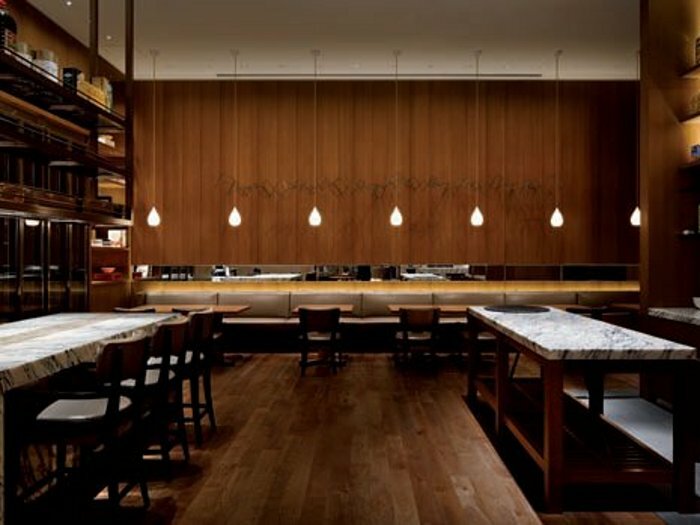 Opposite the bar is a 1m-tall artwork by Japanese artist, Keizaburo Okamura, and a panelled ceiling features hand-blown glass lanterns suspended at varying heights from a 5.2m-high ceiling.